Katharine Payne, a student of both music and biology during her undergraduate years, combined those interests to discover and document the songs of humpback whales. Since the late 1960s when this research began, these 'songs' have entered into the realm of common knowledge. This familiarity and a rather egocentric tendency that homo sapiens exhibit towards other species seems to have trivialized whale communication. 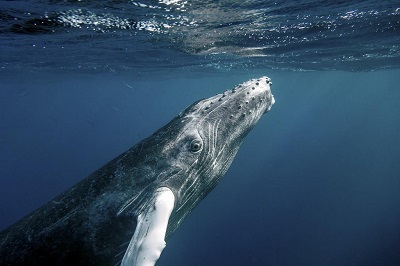 Whales have their own language. It is as simple as that. Humans are not unique in their ability to communicate. In fact, an argument can be made that human language, at best, is rather clumsy and inefficient. If one considers end results, all of human history and the current state of the planet provide all the facts anyone might need to make such an argument. The good that has been accomplished by our species seems to have been done by small groups of people working locally, people who have overcome the language barrier. What evidence is there that whale sounds are no more than the equivalent of our grunts and groans? A discovery by Dr Payne made in 1969 is one piece of the puzzle. She found that whale songs change over time. As winter approaches, all the 'singers' in a particular breeding ground will start singing the previous winter's song. By the end of their migration and the time spent at their feeding ground, these whales will be singing a new song, a very different song. And all the 'singers' in the population will have learned the new song. Obviously, something more complex than grunts and groans is going on here. Katy Payne asserts that the humpbacks do more than just 'talk'; they are using their language to compose and make their own brand of music. The salient fact about all communication within and between species (except humans) is that of integration. Whales are one with their environment, perfectly adapted to all contingencies of life at sea; and the same might be said of aardvarks and zebras and everything in between. And though some humans speak disparagingly of nature red in tooth and claw, the relationships between species and with the environment generally is symbiotic. Are there malicious beasts in the jungle? Nasty brutes that prey on the weak simply from some perverse enjoyment of inflicting pain and suffering? Only homo sapiens. Our language seems, by design, to confuse and confront, to set us apart from one another and from the world around us. Music, however, does seem to be a different behavior all together. Perhaps the whales are on to something. Perhaps what we all need to do is talk a whole lot less and sing a whole lot more.